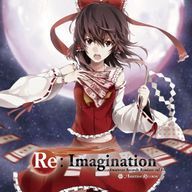 Re:Imagination - Amateras Records Remixes Vol.1- is a doujin album by Amateras Records released on 2012-08-11 (Comiket 82). It features vocal arrangements of themes from Embodiment of Scarlet Devil, Perfect Cherry Blossom, Imperishable Night, Subterranean Animism and Undefined Fantastic Object. It is actually a remix album and the instrumental versions of several tracks can be found on "Amateras Records Exclusive Disc 2012 Winter", released at C83. This page was last edited on 19 January 2017, at 15:48.